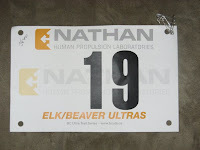 I was pretty excited for this race, as I was considering this to be one of my "A" races this year. The training has been going very well this year so far, and I was hopeful that a 4 hour goal could be achieved. However, as well as the training went leading up to this race, I came down with a nasty chest cold and cough for the taper portion of my training. Therefore, other than one 20k night run, there was next to no running in the last two weeks before the race. I kept telling myself that this wouldn't really matter, as the endurance base had already been built. Race day came, and I was happy with the sleep I got leading up to the race. I was also content with my diet and hydration, so I was as prepared as I could have been. I arrived to the race in good time and spent my warm-up time getting familiar with some of the formalities of the race. I learned that the picnic area at Beaver Lake was used by the runners to line-up all the gels and drinks that would be consumed over the next few hours or so. So I lined mine up next to Rob Mackay and Don Peterson's. It was nice to see a few familiar faces at the race. I am always in awe of how friendly and supportive the running community always seems to be. It truly is quite rare to see anyone who exhibits any sort of negative behaviour. After some small chat, we lined up loosely for the start. The race began and unlike most of the shorter distances, there was no vieing for position, and there was no hammering off the start line. Instead, people seemed to break off into pairs and chat along the way. In these races, it is imperative to find the correct pace. For me, finding this pace can be difficult. I have learned that my body loves to sit back into a 42-43 minute per 10k pace. This is not good when you are running shorter, faster races, because if I lose focus, I slow down. It is also not good for ultra events, because if I lose focus, I tend to speed up - especially early on. My goal pace was to hit 46-47 minutes per 10k loop of the lakes. I latched onto Matthias Schoek from the start because I knew he was attempting to do 45 minute loops. Things were comfortable early and we hit the 5k marker right on 23 minutes. So far so good. The weather was ideal. No wind, no rain, no sun, overcast skies. But I did begin to sweat a little after about 5k or so, and I suspect this was because I was used to running in slightly cooler weather (or I was still a little bit sick). After the 5k mark, Matthias seemed to kick it up a gear and I let him go. I was not going to be a fool and push myself in the least this early in the race. I had done this before in distance events, only to pay the stiff price in the end. At about the 6k mark, I now had caught up to Keith Wakelin and I ran with him for the remainder of the first 10k loop. I got to know him quite well in those 4k, and I was very satisfied when my first loop ended in 46 minutes. I found my gear and grabbed a quick gel and a swig before I headed out for my 2nd loop. Keith was taking more time than I was, so now I was flying solo in the race. I could see Matthias ahead of me by a minute or two and I could also see Rob Mackay - the 50M leader just ahead of me. The goal now on this 2nd loop was just to replicate the first loop over again in 46-47 minutes. While the pace was consistent, my body was giving me signs that a bathroom break was needed. So at the 15 mark, I stopped briefly to ensure that a comfortable race was going to be had. I also forgot that I should be taking an S-Cap every hour, so again, I stopped at the 5k water station to get this done. The 2nd loop would be comfortable and the time would be almost exactly that of my first. I was now at the 20k point, and feeling fine. I stopped again briefly at my gear and headed out for loop #3. As I began this loop, I saw Rob Mackay still just ahead of me. I decided at this point to go after a quicker lap time. I thought if I could get to the 30k marker with a 45 minute loop here, I could bank some valuable time for the miserable 5th loop. And the plan nearly worked. I kept Rob in my sights and at the Hamsterly Beach section, I could see Matthias only about 2 minutes ahead. I felt good and thought I could reel him in a bit. At the 25k point of the race, I was still doing great and I started to tell myself to start counting down the kilometres. Things continued great until about the 29k mark when I started to feel a slight tightening of my right hipflexor and both calves. This feeling came as no surprise, as one enters these races to have a battle with adversity. The 3rd loop ended fine though, and my lap time was again, almost identical to that of the first two (even though I felt I was going faster). The fourth loop now began and right away, I knew this lap was going to be slower. My body was getting tired and muscles were now beginning to get heavy. I was alright with this. Things had gone very well so far, and I was now making it my goal to get through this loop without cramping. I took an extra S-Cap at the rowing boathouse in an effort to stop any tightening. It didn't really work, but I was still trodding along decently. By the straight-section along the back of the lake, I could hardly see Rob Mackay and I would guess he was now about 1k ahead of me. I survived the loop without cramping, and I was now at 40k. The lap time would reflect what was going on, and it took me 50 minutes. And although things seemed to be going South, there really was much to be positive about here. The crowd was telling me "only 1 loop to go - that is nothing", and they were right. I could do 1 loop easy, even if I had to walk. But, I had no intentions of walking it. I had done well so far. The clock was showing 3:10 and I was at 40k. If this were a marathon (and one could easily argue that 40k of the lakes is similar to a 42.2k marathon road course in terms of timing) I had just got a marathon PR. I made it my goal just to get as far as I could without walking now. I told myself that even a slow jog is way faster than a walk. And with that positive thinking, I headed out for the final loop. And while I would love to finish this story telling everyone that I hammered the final loop in 45 minutes or less, the reality is a bit of a different ending. I made it to the 43k point before I had to finally stop and adopt a walk/run agenda. My calves were cramping up pretty regularly and my IT bands had been giving me issues for about the last 10k or so. I was able to get through the next few k's by walking for 2 mins and then jogging for 2 mins. I was actually surprised that I still lapped a few people in this time. However, just as I passed a lady at the 47 marker, my left hamstring cramped as hard as a rock and nearly took my body down to the ground. I stood still and held my leg, writhing in pain. The lady jogged by and asked if I was ok. I nodded painfully and she said, "Stretch it out. You got salt caps?" I nodded again and spent about 2 minutes escaping the cramp. It is funny how I was so close, yet so far at this point. I focused on my breathing and began to walk for a minute. I then tried again to jog it on home, and it seemed to work if I focused on my breathing. It definitely wasn't pretty, but I was now again into a walk/run pattern. I actually caught back up to that lady I saw earlier at the 49k point, and at this point, I was determined to just ensure I ran the finish. As I hit the final stretch I could see my family cheering for me near the finish. I took my daughter's hand and ran the final 20m with her. The race would end successfully in a time of 4:10:55. The last loop definitely was not pretty, but there was much to be proud of. When the results came out, I had finished in 5th place in the 50k race (and 2nd in my age group). Now I spend some time recovering and contemplating my next race. Wow, nice work Jeff! I'm amazed at how consistent your first 3 laps were.